Performance measurement is for every organisation or company, but not necessarily at any time. Sometimes it’s better to quit before you start, to avoid making a big mess. That big mess is a pile of cynicism, fear, misunderstanding, and poorly chosen, wastefully implemented and misused KPIs. Before you start any performance measurement venture, check for signs that suggest you’re about to make a big mess. Sign to Quit #1: Measures are likely to be used to judge people’s performance rather than improve process performance. If you’re certain that measures will be used as tools to judge people, don’t bother starting. You’ll make a bad situation worse. When people feel that measures are solely used as rods for their backs, you have a culture of fear and defensiveness. Performance improvement only works in a climate of trust, openness, experimentation and learning – the complete opposite of fear and defensiveness. Work on the culture first, making it okay to make mistakes if we learn from them, encouraging teamwork and problem-solving that delves into root causes rather than blame. Sign to Quit #2: People don’t understand the difference between working in the business and working on the business. Similarly, if people just don’t understand the concept of performance improvement, of working on the business and not just in it, that’s another sign that it’s too soon for performance measures. Some organisations or businesses have a culture where people turn up to work each day, do the hours, and then get paid. They’re simply selling their hours to the organisation. They don’t feel any responsibility for improving the success or the results of the organisation. Just ticking off tasks. Until you can turn the culture around into one that understands that performance is measured by results and impact and not by effort, a performance measurement campaign will be resisted or treated with cynicism. Sign to Quit #3: People won’t make the time to do it properly. Just fitting it in is not good enough. People won’t turn up at meetings, meetings will be rescheduled, they’ll cut corners to shorten the process, energy will be low, resentment will hang in the air, momentum will slow and you’ll have just created yet another failed attempt to produce great measures. Sign to Quit #4: You’re going to do it the way that everyone else is doing it. There’s an overwhelming tendency in business to assume that measuring performance is a cinch. Just brainstorm some KPIs. Then get someone to report them. Then freak out when this month is worse than last month. You shouldn’t struggle to measure intangible goals. You shouldn’t struggle to find measures that are more meaningful that trivial activity milestones. You shouldn’t struggle to report measures in a way that inspires action. You shouldn’t struggle to interpret signals from our measures and choose improvement initiatives that actually work. 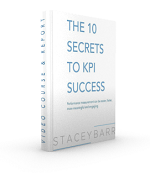 You need a proper KPI approach if it’s going to work. If you start a measurement campaign assuming that “conversation” or “brainstorming” or “SMART” or “KPI libraries” or “dashboards” are all you need, you’ll create a massive mess. Are you pushing performance measurement too soon? If you see any of the signs to quit before you start measuring performance, shift your attention instead to start nurturing the kind of culture that will willingly make the time for it. Oh boy. I’ve just spent 3 years of my life where all 4 of these signals (and more) were raising red flags from the get-go and we ploughed on regardless under a misguided dictatorship that insisted KPI reporting be done a certain way. The resulting ‘dashboard’ was a crosstab grid of numbers containing 70+ ‘KPIs’ measured in up to 3 different ways, most of which were lagging Key Results Indicators. Talk about a white elephant. It’s good to see warnings like this written down by somebody else to confirm my fears when staring down the barrel of a disaster-in-the-making KPI project. Never again! Lee, good luck moving forward from a situation like that! Too much bad practice in KPIs has become common practice. Sadly, your situation is familiar to many.